Front View of Lilly. Photo courtesy The Nature Network. Feel good this Friday by helping a horse called Lilly. 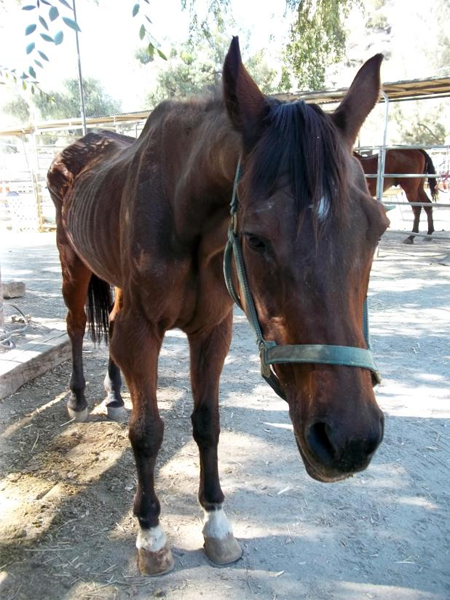 Lilly is a horse who was rescued by The Nature Network in Los Angeles, California, who are determined to see that this sweet girl gets the help she needs. According to the owner, Lilly was being kept with other horses who bullied her and kept her away from the feed, and why she is so skinny and has been injured. The owner intended to send Lilly to slaughter if no one would take her in. We are raising money through our supporters to nurture Lilly back to health. She requires veterinary, teeth and hoof care. The treatment of her teeth is particularly critical to building her weight. 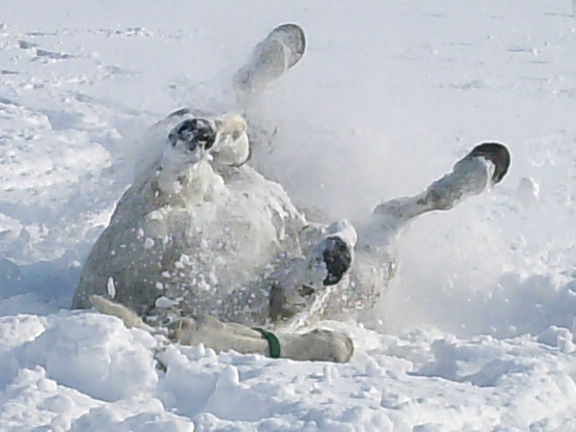 Can you make a donation to the Horse Charities’ Lilly Fund? Every dollar counts. All donations amounts are welcome. We will be following Lilly’s rehabilitation and reporting it to you. Feel good this Friday, and help dear Lilly. More views of Lilly. Click to enlarge. Press Escape key to return to this post. Lilly in Profile. Photo courtesy The Nature Network. Near side view of Lilly. Photo courtesy The Nature Network. Close up of Lilly’s body. Photo courtesy of The Nature Network. 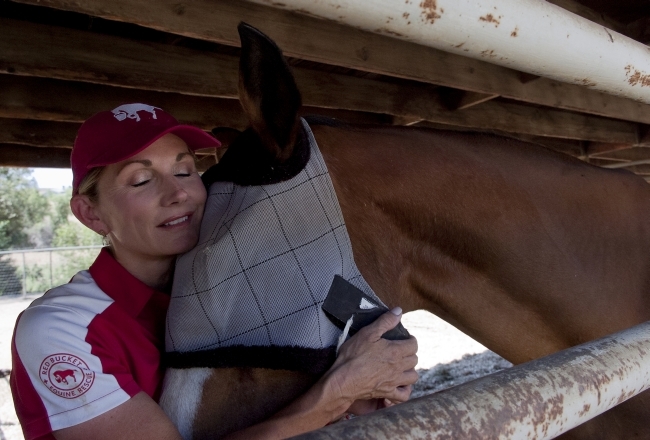 Founder Susan Peirce of Red Bucket Equine Ranch hugs “Baldwin,” who, before being rescued, was going to be fed to mountain lions. (Jennifer Cappuccio Maher/Staff Photographer). The founder of Red Bucket Equine Ranch and its 400 volunteers are on a mission to save and rehabilitate horses who have been abused, neglected or malnourished. 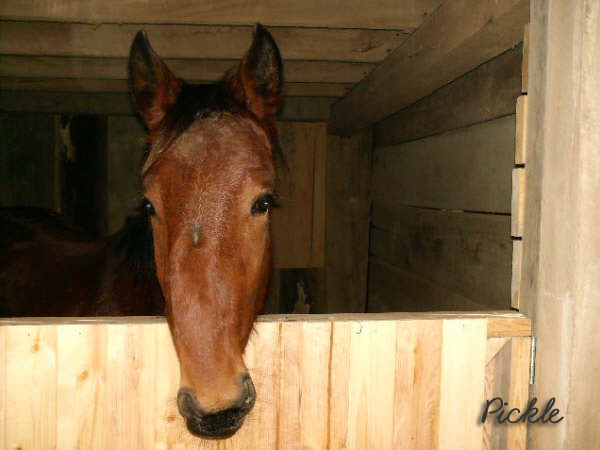 To date, Red Bucket has rescued 109 horses and found permanent homes for 48. “We’ve taken horses that are shattered; they don’t even expect to be fed, let alone us being kind to them,” said Peirce, who has rescued horses from breeding scandals, euthanasia or even being fed to mountain lions. We have all heard the horror stories of dogs and cats, even miniature ponies, used to bait and torn apart by pit bulls. However, never a grown horse. All monstrous. But this is what those who are on the front lines of animal rescue deal with. What is significant about the Red Bucket Equine Ranch story is the attitude of the people who founded, Susan Peirce and her husband David, and Mary Behrens. Based in Chino Hills, California, they run it as a business, an approach which does not exclude what all authentic rescues have, plenty of heart. 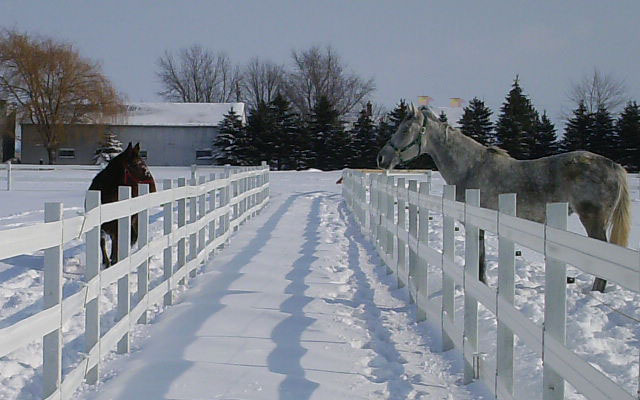 “We believe in the intimacy of the horse. When a horse comes to us, they have nothing of their own, so when they come here they get a red bucket and they get a name,” Peirce said. 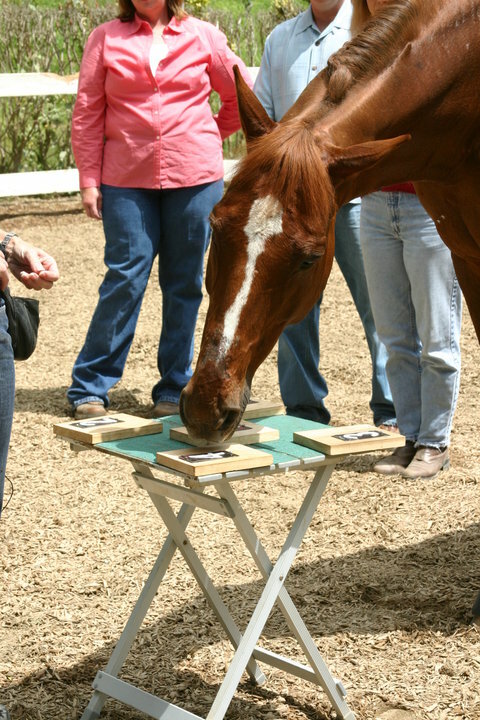 Once the horse gets a bucket with [his or her] name on it, [he or she] also gets a goal and a training plan to prepare [him or her] for adoption. The bucket she refers to is red of course, hence the name Red Bucket Equine Ranch. 17 yo rescued Thoroughbred Lukas attempts Guinness Record for World's Smartest Horse. We all know he is. Photograph from Lukas' Facebook page. Cheers! On June 16, Lukas was able to identify a correct number at least 18 times. He ran three races as a 2-year-old and bowed both front tendons, ending his career. He was found years later filthy and emaciated in a back yard by a woman who took pity on him. She tried to rehabilitate him for her jumping program-but he was obstinate and dangerous. She sold him to Murdock eight years ago. >> Visit Playing with Lukas on Facebook. He’s also on Twitter . . . naturally!